I am a huge fan of peanuts right from my childhood. Even Thaara is like that, she loves peanut, in any form. For snack, I prepared this fried peanuts. Of course, she was standing by my side and watching. Then I made a paper cone and filled it with the peanuts and gave to her. She finished it all. She absolutely loved the way I served it to her in cone. Happily she posed for the pictures, I clicked for the post. 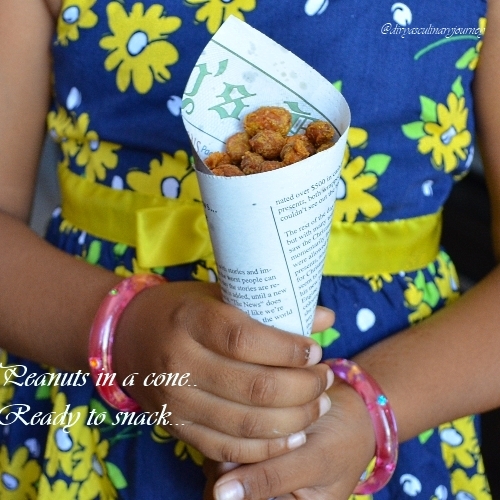 Peanuts in paper cone is nostalgic.Those days they sell them in such paper cones in shops or the person who sells them in the streets. This is a great snack for both kids and adults to munch on. Now coming to the recipe.. 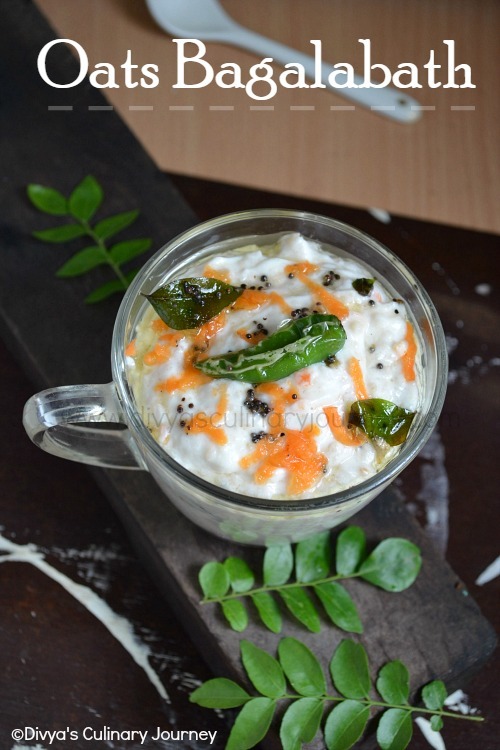 In a bowl combine together, besan, chilli, coriander, cumin, turmeric powders, asafoetida, baking soda and salt. Add water and mix well. To this add peanuts and mix well such that the peanuts are fully covered with the batter. Heat oil and deep fry the peanuts in batches in medium flame. When they turn golden brown, remove them, drain the excess oil in paper towel. Let them cool completely and enjoy the snack. very crisp and tempting one..
What a coincidence, Divya! My today's post is also spicy peanuts.. But mine is oven baked though. 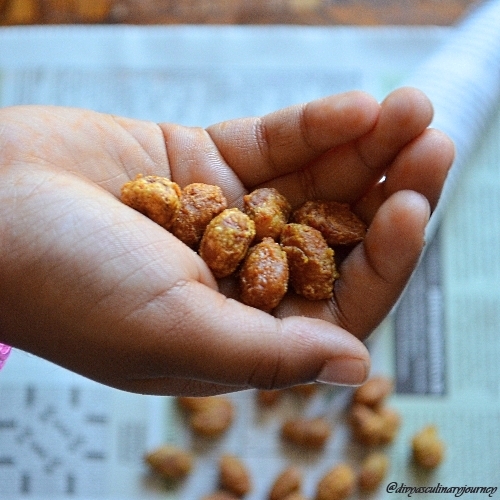 crunchy n yummy looking masala peanuts...its my kids fav too, they too love it a lot :) loved your clicks too..very neat!! 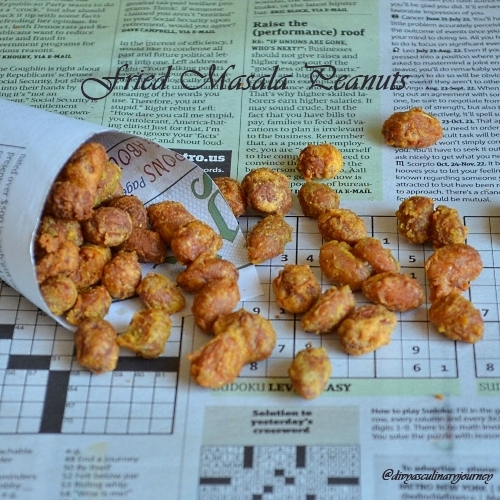 Simply love this addictive and super crispy peanuts, my all time favourite. Wonderful snack with beautiful pictures too, perfect dear! Looks very crispy.. I love the ones made at home than store bought as the flavor is mild when we make it at home . thats a perfect snack with tea for me. I love your daughter's dress..so pretty..and of course I gobble those peanuts, I had them just yesterday too..:)..picture looks great..
Love these peanuts and looks so tempting. I love the presentation and your daughter's dress. What a unique idea and good to know that she was patient enough to pose for the picture with peanuts in hand. My 4 year old loves peanuts too. I've to make these for him. Thanks for the recipe.